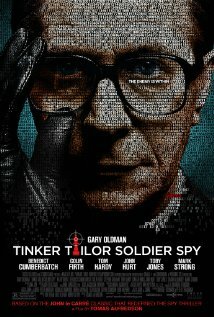 Focus Features releases Tinker Tailor Soldier Spy on December 9th, 2011. NYC MOVIE GURU: How did you find the right balance between entertaining the audience and provoking them intellectually? How important is it to trust the audience’s intelligence? Tomas Alfredson: Very much. I think too many films today are monologues, and you’re spoon-fed just exactly what the filmmakers want you to see and think. I think it’s much more interesting to have a dialogue and to trust the audience’s intelligence. And that you suggest stuff. That you have to work a little as a viewer – why not? I don’t want to decide everything in a film. Like, the ending; I have heard so many interpretationso f what happens there, what kind of action that is---and that’s wonderful to hear that it could be interpreted so differently. I think the audience is a very useful part of the whole cinema experience. You should be a little exhausted afterwards. It’s nice. In this kind of a film, you shouldn’t be sure, and you should do some work. NYC MOVIE GURU: How did the casting process work? Did you start with Gary Oldman, and then move down the list? TA: Yes. We had to have the character George Smiley in place first. We were almost panicking because we couldn’t get the right idea to place George. The problem with George is that he is described as someone you would immediately forget. You know, anyone’s uncle. To find an actor who could not be boring, but depict boredom or dullness – that was the trick. If you look at what Gary Oldman has done through the years, he’s very much a chameleon. And he was the perfect chameleon for us. So I went to Los Angeles with a very short list with one name on it, and we met and connected very well. And then we started the rest of the casting process. But the rest was quite easy. It just fell very naturally in place. I think about 95% of the cast were our first choices. NYC MOVIE GURU: What was your visual approach to Tinker Tailor Soldier Spy? TA: We tried to, me and Hoyte van Hoytema, the D.P., create a sense of paranoia. The scenes were designed to have the feeling as if there were a stranger in the room, so we tried to find the voyeuristic perspective. As you might notice, a lot of it is shot from outside – through a window or peeping holes. That was one idea we had. We also discussed the possibility of translating a scent into visuals. Try to imagine damp tweed, the scent of damp tweed, or cabbage or something. How would that look if you made a film that had that scent? NYC MOVIE GURU: Did it help to do a very classic English story as a foreigner? TA: I suppose, yes. I think the main difference between being a Swede and being English is that they have this very sophisticated class system that is very connected to the language, how people talk. It is very hard to understand how it works, and interesting to explore, I think – I’m not sure – but I think I see that clearer than you might. NYC MOVIE GURU: What did you enjoy most about recreating the period of time depicted in the film? TA: It’s quite fun as a filmmaker to recreate another era. Imagine doing a period piece about 2006 — what did they wear in 2006? It’s almost impossible to remember. But ’73 is much easier, so the distance makes it easier, especially if you have lived it yourself. I was eight-years-old then, so I remember quite clearly what was happening. It’s a lot of fun — oh, this magazine I remember, and oh, this song I remember. I visited England the first time in 1973, and I’ve used a lot of those memories Tinker Tailor Soldier Spy.